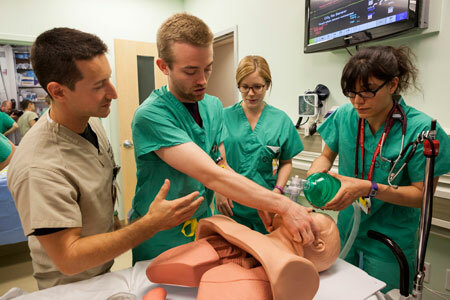 Providing a humanistic education in the art and science of medicine is the overarching mission of the Cooper Medical School of Rowan University (CMSRU) Simulation and Clinical Skills Center. We create and support programming designed to teach and enhance clinical competence and skill, teamwork, interdisciplinary partnership and interprofessional collaboration. The simulation team supports the education of future clinicians across the entire curricular spectrum. Immersive simulation training begins early in the M1 year “Foundations of Medical Practice” (FMP) course, and continues through the M3 curriculum in support of basic science initiatives, sub-specialty clerkships and M4 sub-internships. To advance the field of healthcare simulation, the CMSRU Simulation and Clinical Skills Center conducts innovative research into patient safety, medical education, simulation theory, practice, and technology. We utilize simulation modalities such as standardized patients (SPs), task trainers and high fidelity mannequins to realistically replicate the clinical environment.